The best stock photo there ever was. Publix supermarkets—a regional chain concentrated in the Southeast, for those who haven’t had the pleasure—is taking a stand on dogs in grocery carts. And that stand is a very clear “no.” New signs across its locations inform shoppers that for food-safety reasons, only service animals are allowed inside the store, and even then, they may not ride in grocery carts, period. The Orlando Sentinel reports this isn’t a new policy, but the recent signs are designed to make customers “more aware” of the rules. Service animals, the paper notes, have become a hot topic as some people take advantage of federal disability laws to take their pets into businesses. Publix’s policy seems fairly reasonable to me. 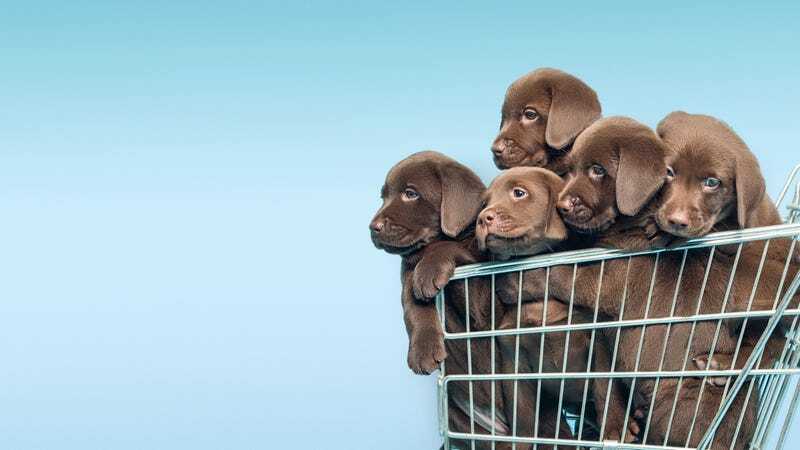 The store isn’t prohibiting anyone from shopping with a service animal, but I would imagine wheeling animals around in grocery carts—or baskets, if you have a toy breed—could raise hygiene concerns. (As more stores offer hygiene wipes near the carts and baskets, it’s probably not a bad idea to use ’em, dog or not.) I once saw a woman shopping in a grocery store with her Chihuahua-looking dog on a leash; it had no visible service animal credentials. What if that dog, I don’t know, relieved itself near the avocado display? Though I guess pet owners could argue that some toddlers are messier even than puppies. And they might have a point.